The pitch was Pokemon Go meets Call of Duty. I couldn’t quite fathom how that would turn into a cool as hell game, but it involved augmented reality, a key feature of Pokemon Go, and laser tag, and those are both very fun things. Then I sat down with the team from Skyrocket and got to actually hold one of the guns from its new Recoil laser tag system. “It’s AR adjacent,players” the PR rep said. My interest plummeted, but I gamely let them set up the demo and tried to play for an hour. While it quickly became clear this was only Pokemon Go meets Call of Duty in the most high brow theoretical sense, it was also clear that Recoil could be the best backyard laser tag system built yet. The system itself is composed of a wi-fi router, hefty toy guns, and the players' phones. You load the Recoil app onto the phones, log into the local network created by the router, and set up the game. Skyrocket insists there will be multiple game types at launch later this summer, and promises even more games in the months to come. Yet for the demo we had a straight team deathmatch. You pair off, wait for the clock to wind down and then start shooting. The rapid click of plastic triggers on the sturdy guns quickly create a cacophony that will remind you of lazy summer days playing make believe in the backyard. The assault rifle costs extra. The guns are a definite focal point. 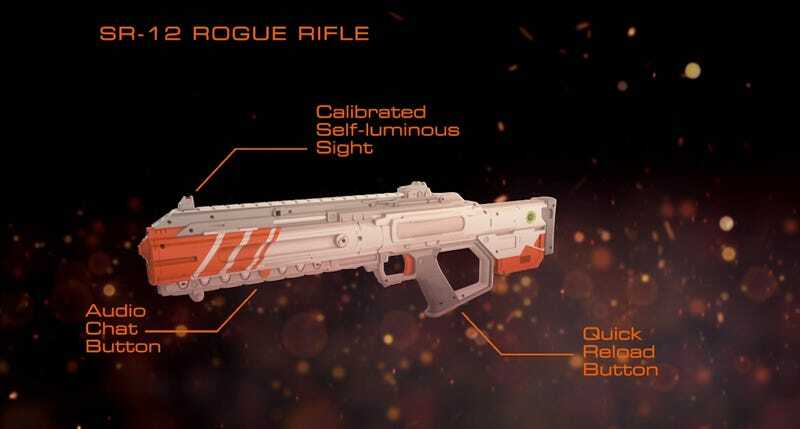 They have a lot of the weight of an airsoft gun — or something realer— but with a design intended to be safe to use outdoors — where Skyrocket says players will have the best experience. The system is heavily reliant on GPS, which is best tracked outdoors. Whether or not it is actually safe to use them outdoors in your area will, naturally, be a gut check on your part. Yet the heart and soul of the game is the player’s phone. It pairs with your gun via Bluetooth and then does very Call of Duty-like things such as track your health and ammo. It also pops up a minimap so you can see the other players, power-ups, and more health and ammo on the map, and if another player decides to drop a missile on your head using a Pokemon Go-like minigame the phone will sound an alarm, urging you to hustle out of the blast radius and tracking the very real distance away it demands you move to. 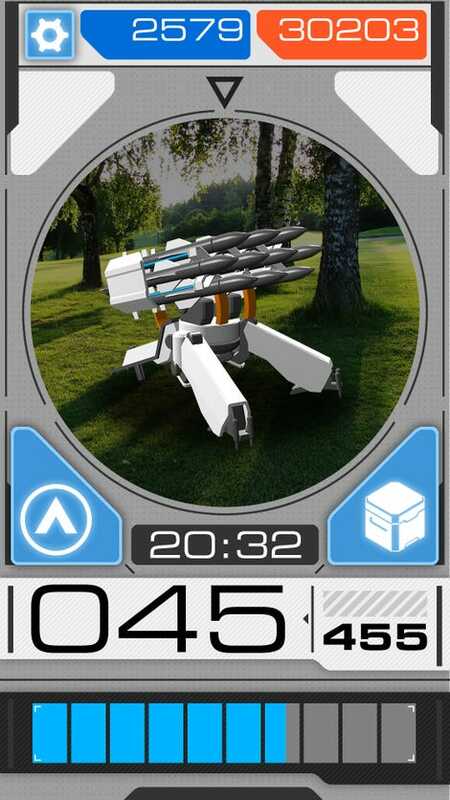 The missile launch mini-game is the most AR-like feature Skyrocket had available in the demo. You press a button on your phone when you’re close to the GPS coordinates for the missile launch system and then your phone’s camera is activated and a silly looking missile launch pad hovers over the image coming from your phone’s camera — sort of like that Pikachu that hovers in the street when you try to catch it in Pokemon Go. It’s also the goofiest feature. The real magic of Recoil is in the way it incorporates a very solid laser tag system with GPS. I got to play for an hour in a controlled demo at a local park, but it was every bit as fun as a round of paintball in the woods or a quick game of laser tag in a warehouse. Except the price to build this system for your backyard is infinitely cheaper. When Recoil launches in August at major retailers, two pistols and the necessary wi-fi router will retail for just $130 (£100). Additional pistols will go for $50 (£38), assault rifles for $80 (£62), and grenades (which were not available at the demo) for $15 (£11). Skyrocket also told Gizmodo that a sniper rifle, which will significantly feature AR, and a shotgun, will be available later this year or in early 2018. It might not quite be Pokemon Go, but this system has the potential to be a great real world Call of Duty.